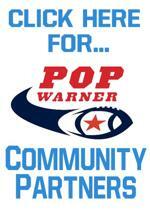 Pop Warner Little Panthers has launched a "Community Partners" Page. This page allow hotels, restaurants, dentists, travel agencies, etc. the opportunity to connect with Pop Warner Little Panthers athletes, parents, coaches and fans. If you are interested in participating, click the link to the Community Partners Program below. However, if you would like more information, email mnewell@focus-communications.com or call 704-992-2838.